PEORIA — Michael Franti has been around a long time and has basked in the glow of many summers, so it's a bit of a surprise when he declared that this summer has been his favorite yet. The reason behind that pronouncement is simple enough. More than any other time he can remember in the country, people are seeking powerful and positive experiences within a community setting, which might be the overriding credo of his group Michael Franti & Spearhead. "We create a dance party that is super fun but is with intention," Franti said in his trademark measured voice. "And right now it's the intention to be encouraging people to love out loud." In fact, "Love Out Loud" is the name of the band's current tour that will stop on the Peoria riverfront on Tuesday. 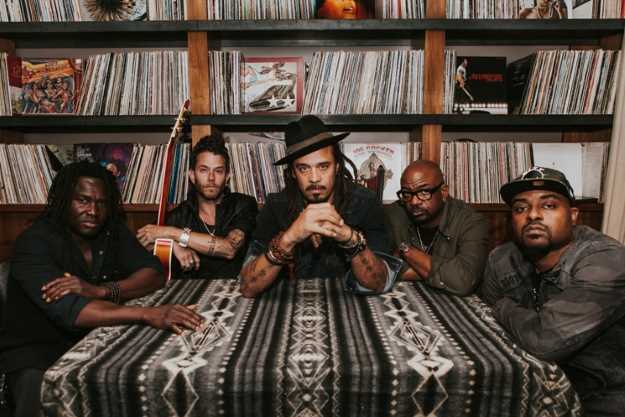 Central Illinois music fans will be treated to Franti's signature style that fuses hip-hop with all manner of genres like rock, folk, reggae and dance hall. The earlier songs in his discography were lyrically dense, a thicket of words and rhymes. In the past decade, though, he's embraced a simpler approach with catchy rhythms that belong on a summer playlist. Ahead of the show, we chatted with Franti about the Clash's influence on his music, songwriting and the lessons of his song "Say Hey (I Love You)." Q: Were you surprised by your maturation as a songwriter over the years, choosing simpler lyrics and themes as you got older? A: I've always admired great songwriters and the songwriters that I love are people who are able to tell a story to a beat that you can dance to. To that end, I love Bob Marley, I love Johnny Cash, I love John Lennon, I love Run DMC. They're incredible storytellers. I love The Clash. So as I've studied the craft of songwriting, I've found that the best songwriters can say what they mean right from the very first line. There's just no wasted words. Q: I could see you being a big "Sandinista"-era fan of The Clash. A: I love that one. When I was growing up, that was the record. As I was coming of age in high school, The Clash were on my radar because I loved reggae music and they were inspired by reggae. But I was also into punk rock and they were there. And I was also into hip-hop and they were also into rap. They had the three types of music, and they incorporated all of those into their own thing. They had songs that were pop songs, but especially on the double album with "Sandinista," there were so many songs that were bordering on free-form jazz and dub reggae. And of course the lyrical content that was inspired by the Sandinista movement in Nicaragua that later became front page news years after they wrote about it. Q: When talking about the different genres inherent in The Clash's music, you can see the influence on your own where any given song can go in any direction. Do you pride yourself on that trait of your music? A: Well, there's some days when I feel like it's a curse. I feel like, "man if we just stuck to the same old thing we'd be on the radio all the time." But it's just what I love. I love so many different kinds of music, and I'm always trying to find the best palette to express the picture that I'm trying to paint. Sometimes it means using an orchestra and other times it means doing something electronic. Other times it means it's just going to be me and a wooden guitar, and other times it's going to be a loud rock anthem. And fortunately, over the years, our audience has come to expect that from us and embrace the weirdness (laughs). Q: One of the lines in your songs that always sticks out to me, from "Say Hey (I Love You)," is "the more I see, the less I know." That seems at odds with our current information-fueled society. What do you see as the value of that line and that ethos in life? A: I wrote the song about having spent a lot of time traveling and how, when you go to a new place and say, "Wow, I can check that off my list." But whenever you get there, it just opens your eyes to this whole other world of experience that you end up walking away from it having more questions than you did answers. And you're right that the political climate we're in right now and the social media climate that we're in right now, we think that we're going to go to our phone and we're going to find out all these new answers. And then we end up walking away feeling more confused or angry or like we want to go out and change the world. I don't think it's a bad thing. I think when I first wrote the song, it was a lament: "Oh man, the more I see the less I know." But now I think of it as a positive thing. The more I see the more curiosity I have and the more questions it inspires.